Canary Wharf underground station offers the best and the worst opportunity an artist could hope for. “There are 45 million people who will travel through that station per annum, which is extraordinary. There’s no gallery in the world which could even boast a fraction of that kind of potential audience,” says John Gerrard. Gerrard is responsible for a vast projection on the far wall of atrium, which requires nothing if not patience. The computer generated simulation unfolds in real time, day by day, with a narrative scheduled to last for 30 years. 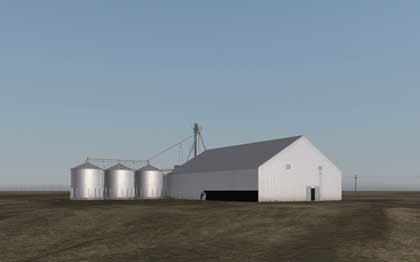 Oil Stick Work (Angelo Martinez/Richfield, Kansas) is set in a Kansas landscape dominated by a grain silo. Dawn breaks about noon British Summer Time and the scene fades to darkness at around 2am. Between those times, a lone figure sets to work painting the building black. He paints one square metre each day with an artist’s crayon. By the time he completes his task, in 2038, US oil supplies are projected to run dry. Art on the Underground will be showing the astonishing time based work for 12 months, and Gerrard hopes that in that time a “fraction” of the audience will notice the work’s progression. The tempo of his art is a far cry from the pace of nearby life. The Jubilee Line station serves some of the world’s busiest banks. “I think the banking context is a very good foil for the work, for the slow build of the work,” says the Irish artist. He also expresses amazement at the latest forms of (high frequency and algorithmic) trading. “It’s almost become quite anarchic what’s happening in those environments,” he says. The central theme in Oil Stick Work, intensive farming, is clearly not unrelated. In the 1930s, oil-powered agriculture caused catastrophe when the prairies succumbed to the worst dust storms ever seen in America. Today the same landscapes are dominated by ominous and anonymous buildings such as the grain silo above or the grow finish units used to farm and slaughter pigs. People are few and far between, but with one notable exception. The unreal localities which inspired Oil Stick Work are well suited to 3D simulations. “I’m slightly on my own with the medium which is curious,” notes the artist. That medium, according to Gerrard, “was effectively born in a military context,” and for his next work his is taking the form back to its roots. This will be the first time the artist has used military training technology to recreate a military training exercise. “I’ll see how that goes. I mean, it’s a bit of a risk,” he says. But despite the outward calm of a piece like Oil Stick Work, organised aggression is already very much a theme. From Kansas to Canary Wharf, what you cannot see is what can shock the most.